O3 World is a Philadelphia-based digital product design and development agency that is rapidly growing. After outgrowing their previous office, O3 World started the process of expanding their space. As the company continues to grow, it is important for O3 World to invest in their workspace and establish a creative environment that their employees can enjoy. “O3 World’s new office space is located in a repurposed warehouse that has been beautifully renovated, but still contains the charm of the building's history through classic industrial touches. 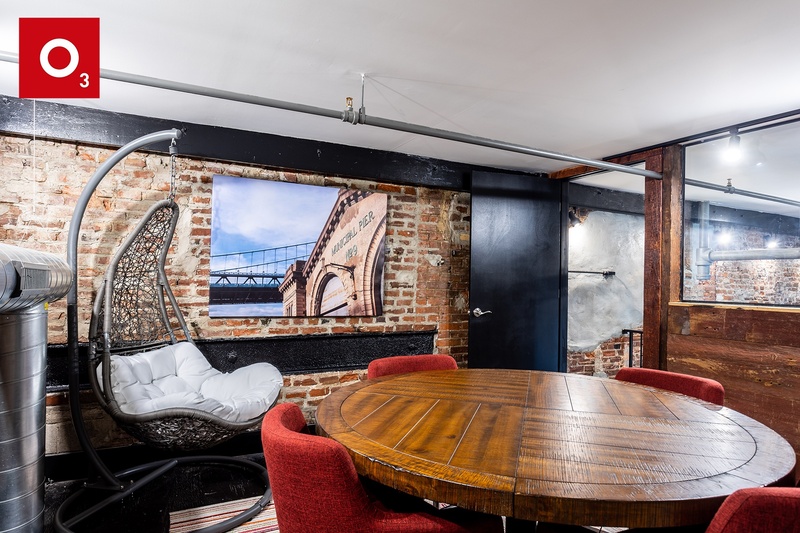 Elements like exposed brick and piping create a contemporary-industrial vibe that made the space really exciting to work with; you can even find some of the original metal peaking through the drywall. With the flexibility of of our lease-and-rotation program, O3 World can continue to support their local art community through a curated collection that evolves with them as their space and team continue to grow. "Our team wanted the office to feel comfortable and cared for, but we also wanted to avoid investing time and money in tailoring an art collection for a space that’s expected to change as our company grows. With TurningArt’s lease & rotation program, our art advisor curated a beautiful collection to complement the design of our current space, which we can then choose to keep, swap, or expand in the next space. We were also thrilled to learn that, if the time comes to move, TurningArt will pack up, deliver, and re-install the art in our new office.